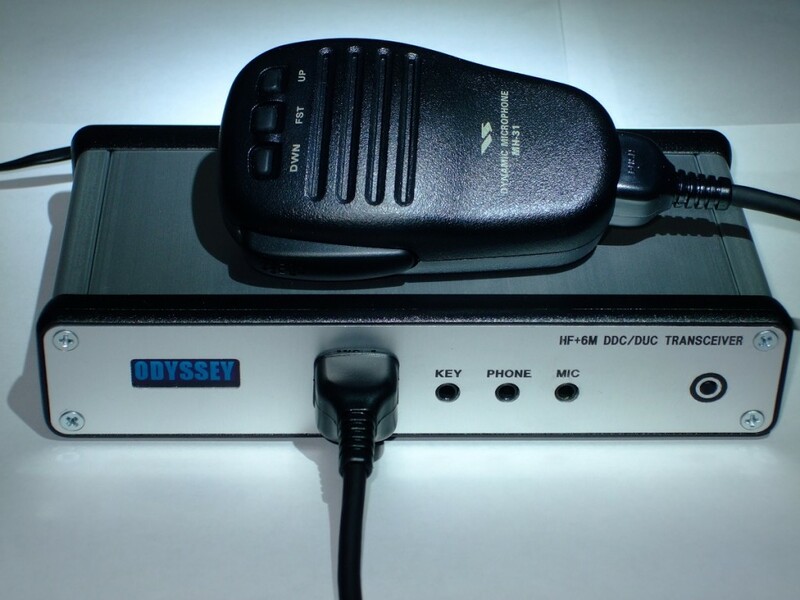 The new version of Odyssey TRX transceiver raises the bar of quality and capabilities, while remaining relatively cheap and simple, accessible for self-assembling device. All known shortcomings of the previous version were eliminated, starting with the layout of the case. Now it has a more familiar, classic look. To make such a case from the standard of the Hammond line, it is necessary to take a specimen of a larger size and shorten its length approximately in half. This approach, with almost the same board area, makes it much more reasonable to use the space and the much larger area of the front and back covers allows you to freely place the necessary connectors in the right place and add a few new ones. The rear panel adds an input for the second receiver and a 1 Watt RF driver output. Peripheral control is now accessed on a 15-pin connector (DB-15). The new layout also had a very favorable effect on the convenience of board layout. and a microcontroller (MCU) for power management and other functions of the transceiver. simultaneous reception of signals from two different antennas. The design of the this transceiver allows the builder do not install the second ADC in order to reduce it’s cost if the second ADC functionality is not needed. There is always the possibility of adding the missing components later and no special firmware will be needed. 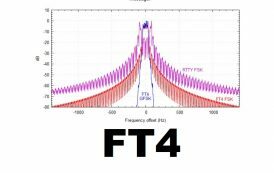 The new version of the transceiver uses a pre-amp buffer in front of the ADC which result in sensitivity of the receiving path -134dBm (MDS 500). This is LTC6401-14, a low-consumption version of the well known LTC6400 ADC driver family. For users who do not want to accept some loss of receiver’s parameters due to the use of non-switchable pre-amp, it is possible to work without them. To do this, it is necessary to desolder the ADC driver and close two jumpers on the back of the board. Also, one more jumper allows setting the level of the full scale of the ADC, 1 or 0.5 Volts (in fact — the gain 0 — 6 dB). In this case, the receiver path becomes identical to the Odyssey-I. During the measurements I was not able to see any significant difference in the DR (dynamic range of received signals) between the pre-amp version with the ADC gain of 0dB and without pre-amp and the gain of 6dB. The receiver shows a very decent value of BDR – almost 115db (MDS500). The separation of the reception channels between the ADCs is very good — 95 dB (10 MHz). One disadvantage of the original Odyssey-I was the use of the BGA616 amplifier for the PA. Users have repeatedly noted a propensity for this part to fail. I personally also once faced a sudden PA failure. The new version uses an OPA2677U high-speed op-amp as an amplifier. This is a low-voltage version of the well-known OPA2674. One of the channels of the amplifier produces a small RF signal of 0.5 volts (at a load of 50 ohms, peak value) on a separate output for operation of the transceiver for the VNA (Vector Network Analyzer) mode. 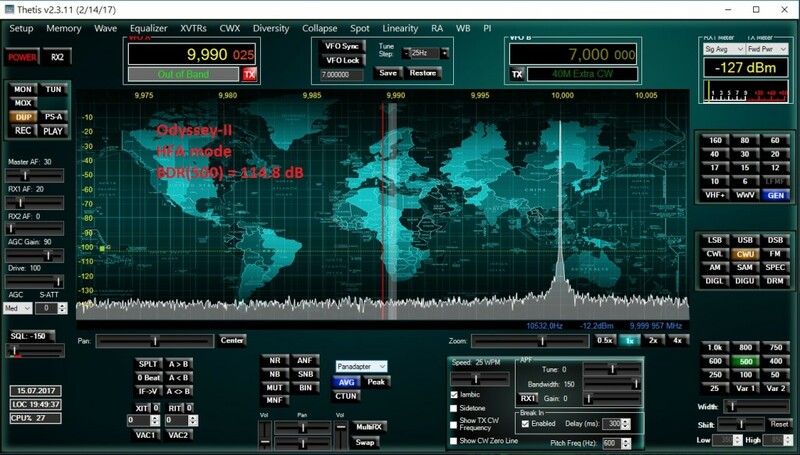 The signal quality is very high showing a measured value of IMD3 is -70 dB. The second channel of this amplifier works at the input to a small PA (power amplifier), providing an output of 10 volts (peak value), which corresponds to one Watt output power (at 50 Ohm load). The final PA is a push-pull architecture using PD85004 transistors. Unfortunately in the current configuration, the linearity of the amplifier at the maximum output level results just -40dB IMD3, which is probably due to distortions in the op-amp that is powered by a 5-volt source. The transceiver board also provides the option of supplying the main Vdc of the transceiver to this amplifier (10 — 13 Volts), which probably will improve the parameters by IMD. Note that in this case, the supply voltage will not be switched when the transceiver is turned off, which may be undesirable in some cases. The total supply voltage in this case should not exceed 13 Volts, otherwise it will exceed the maximum permissible level for this chip. This problem should be studied in the future. The DAC of the transmitter remains the same, this is the AD9744. The audio codec is still the same, well-proven TLV320AIC23B. The audio system of the transceiver is equipped with a small audio frequency TDA2822D, giving out up to 0.5 Watts of output power with an 8 ohm speaker, which provides some very interesting possibilities for the user. 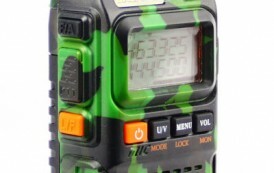 For example, you can build a small speaker into the transceiver case, which would completely eliminate the use of the sound system of the controlling computer. This would be extremely useful when using a mobile phone (i.e. Smartphone with the GØORX OpenHPSDR application for Android) or a single-board mini-computer such as RaspBerry (GØORX PiHPSDR project) as the controlling computer. To connect the speaker, the board has an appropriate connector. The sound amplifier can be disconnected by a signal from the MCU, so that the sound from it does not interfere with the use of headphones or the sound system of the computer. The RJ-45 connector on the front panel is designed primarily for connecting hand-held microphones (tangent) and is compatible with various models from Yaesu. I recommended the model MH-31, which is equipped with a high-quality dynamic microphone and has the ability to choose the tonal color of the formed signal. Three additional buttons are connected to the microcontroller and can be used to control various functions of the transceiver such as turning on/off the output RF driver, audio Amp. Additionally, this connector could be used for connection to “all-in-one” tangents from portable VHF radio. Making the necessary wiring routing to the RJ-45 connector is not difficult. Such tangents include also a speaker inside. To make it work, need to use the jumper located on the board. Yaesu’s standard pinout does not provide this signal on the connector, since their hand-held microphones do not include a speaker. The bias voltage for the electrically powered microphones is not fed to the tangent, it can be formed from the 5-volt voltage that is present on the connector. Any kind of microphones can be connected to the MIC MiniJack 3.5mm connector, there is a switch on the board that can be used to disable the bias voltage for dynamic type of microphones. One of the pins of this connector can be used to for PTT. This can be useful when connecting a desktop microphone that has a PTT button on the case. The PTT function of this connector can be disabled using the switch on the board if it is not used, because when the connector is connecting, the transceiver can accidentally go uncontrollably to the transmission. In general, a PTT pedal or switch will most conveniently be connected to one of the pins of the control connector on the rear panel or to one of the pins of the CW KEY connector. A small graphic OLED display with a resolution of 128 * 32 dots is connected to the control microcontroller of the transceiver. This is PIC16F1827, it is currently used to control the power of the transceiver, turn on/off the output RF transmitter and audio amplifier and also has a connection to the FPGA. In the future, it is planned to make an indication of some modes and possibly an indication of the SWR level in the transmission mode. At the moment he only shows the logo. A Low-frequency 12-bit two-channel ADC type MCP3202 has a maximum range of the measured voltage of 3 Volts and allows to obtain data for calculating the output power and SWR. 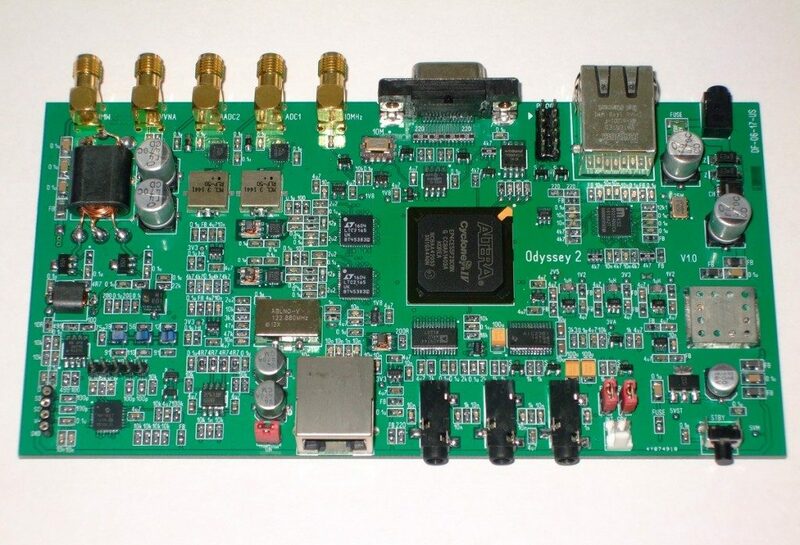 As is known, the software development of the previous version of the transceiver stopped as a result of the lack of space in the FPGA of small capacity. The new version uses a powerful chip Cyclone 4 EP4CE55F23. A step of pads at it same, as well as in the last version so any problems with the soldering will not be. For communication with a PC, the KSZ9031 chip (low-power version of KSZ9021) is used. It works in Gigabit Ethernetmode and this is an extremely important detail for the design of this transceiver because in this case there is no specific interference from the Ethernet cable affecting the most important 20M Amateur Radio band (14 MHz). In addition, unlike the 100 Mb mode, the network connection will not be the bottleneck when sending signals to the computer from several receivers even with a 1536kHz panorama width. 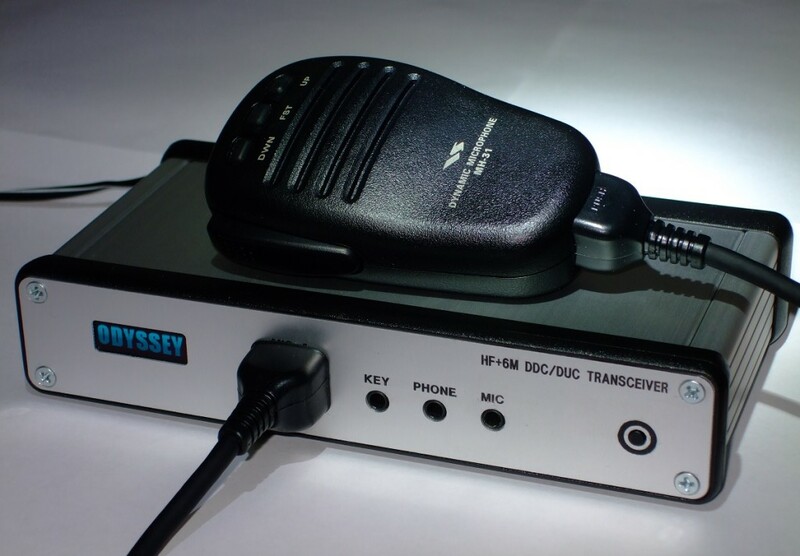 For the Odyssey-II transceiver there will be several firmware versions available. Two of the versions of the ported OpenHPSDR firmware (Angelia board) with the support old and new protocol, respectively. Later, the main firmware of the transceiver will appear, with which it will open its full potential working with its own original protocol.